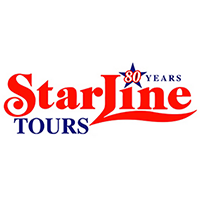 ● Book your tour online and get discounts as high as 10% off adult and children’s rates through Starline’s promotional online pricing. ● Visit all the famous LA attractions from Hollywood to Beverly Hills using Starline’s Hop-On, Hop-Off city tours and save on admission to popular places like Universal Studios and Madame Tussauds through the Show and Save promotion. If you are visiting a certain area, you may want to check out Starline Tours beforehand. The website for this company has been providing tours of Los Angeles for decades. You can visit the website to learn how you can take an informative tour of the part of Los Angeles that interests you most. Daily tours are also available in such areas as Santa Monica, Anaheim, San Francisco, San Diego, and even New York. Multi-day tour services are also available through Starline Tours, in addition to coach services like bus charters and party buses. You can even arrange to be picked up at your hotel. You can book your tour online, as well. For most up to date offers check out StarLine Tours on Facebook and Twitter or contact StarLine Tours Support for any questions.